This pesto couscous is a simple side dish that comes together in 10 minutes flat. It’s a great way to jazz up regular couscous and goes perfectly with any meat or seafood. When I think about family dinners growing up, the box of Far East couscous stands out vividly in my mind. I’m pretty sure we ate that stuff at least 3 meals a week and after awhile it would come with whines of “couscous? Agaaaaain, mom?? ?” from the dinner table. I get it though, it’s pretty much the simplest thing you can ever make, easier than rice and even pasta. The only thing is…it’s just boring. 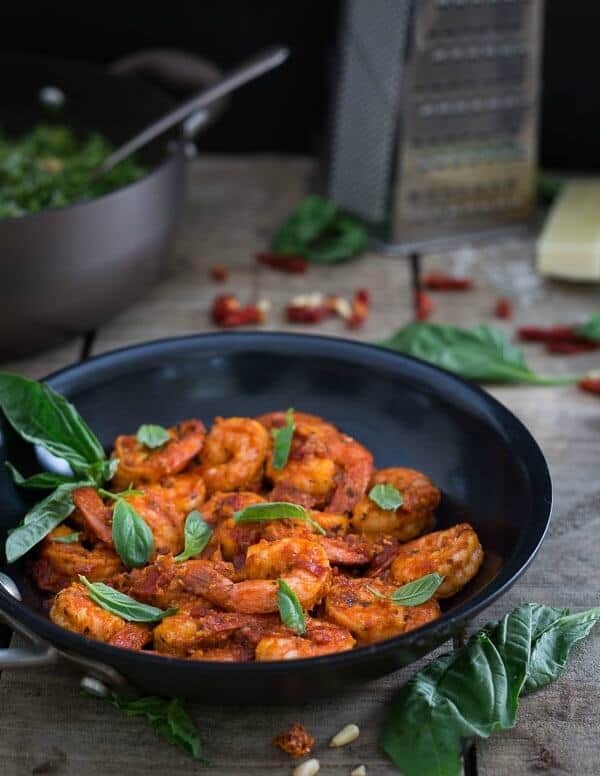 Which is why we’re jazzing it up with pesto today and using it as a beautiful bed for this Bumble Bee SuperFresh Spicy Shrimp Romesco. I’m completely impressed by these fresh frozen meals. From their ease of preparation, to their price, to their taste and most importantly to me, how the seafood is sourced. I’m a huge advocate of sustainably sourced seafood and had my doubts when I first heard about these meals. I was proven wrong though. The ingredient list on all the meals is short, pronounceable, preservative free and is sourced from either wild fisheries or aquaculture farms that have earned official certification from strict third party organizations. That’s the kind of frozen meal I can get behind. Each meal is two servings and you can choose from different varieties of shrimp, scallops, salmon and tilapia. 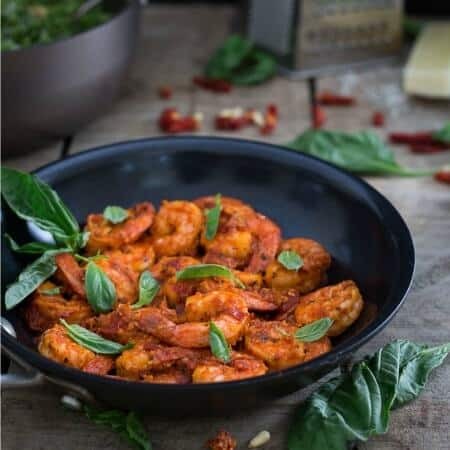 I decided to test out the spicy shrimp romesco. With tomatoes, olive oil, garlic, shallots and parsley, it sounded like the perfect accompaniment to the pesto couscous for an easy dinner option. Considering I’d pay the same amount, if not more for shrimp that I’d have to peel and de-vein at home myself (something I absolutely loathe doing) and then have to make the sauce from scratch, this meal for two at $10.99 seems like quite the steal. The shrimp cook in a skillet, you drain the water off, pop the frozen sauce cubes into the pan and toss it all together. That’s it. I loved the kick of heat to the shrimp and the freshness of the pesto couscous was the perfect balance to each bite. They’d make a great date night (or even Valentine’s Day) dinner too when you want something impressive minus all the work. Bumble Bee’s website even has great menu ideas by season and wine pairings for each meal. The entire meal, pesto couscous included, comes together in about 15 minutes. Seriously. This pesto couscous is a simple side dish that comes together in 10 minutes flat. It's a great way to jazz up regular couscous and goes perfectly with any meat or seafood. Combine the spinach, basil, parmesan, pine nuts, sun dried tomatoes, garlic, salt and pepper in a food process and process until finely chopped. With the processor running, drizzle in the olive oil until smooth. Bring the broth or water to a boil in a medium sauce pot. Once boiling, add the couscous, stir, cover and remove from heat. Let sit for 5 minutes. Fluff the couscous with a fork, add the pesto and stir until well combined. This post is sponsored by FitFluential on behalf of Bumble Bee SuperFresh. this sounds amazing! Exactly the kinda meal I would love, and as I have shrimp in my freezer, I can actually make it! THANK You! Perfect runner food for marathon training. Yum! PESTO COUSCOUS? Yes pelase! We’re big on couscous and pesto here, but definitely have thought to put ’em together. Clearly I need to change that and get my hands on those shrimps. Pinned! Pesto and couscous? Sign me up! Couscuos and pesto together sounds incredible! Must make this soon! Love this, and I found a whole grain couscous at Trader Joe’s that’ll be perfect! This looks delicious and your photos are beautiful! Pinned! Love how much flavor you’ve packed into a single dish! This looks incredible! I could eat pesto on just about anything! What a great combination! Green couscous is such a nice classic base, especially combined with plenty of spice. Yay! 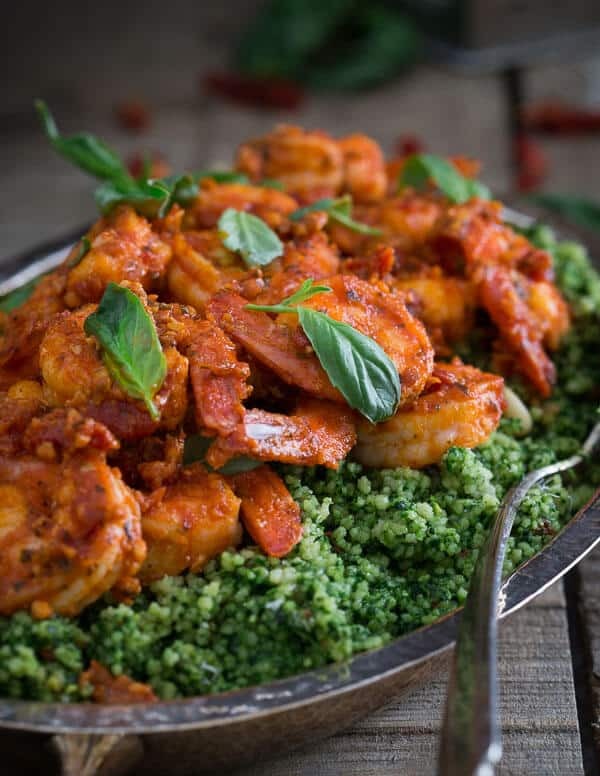 OH my gosh this is totally gorgeous and I love the two different flavor combos combined from the pesto couscous and shrimp romesco! YUM!! What an awesome side dish this pesto couscous would make for dinner tonight – love how super easy and flavoursome it is! I’ve seen pesto mixed with pasta, gnocchi and even rice but never couscous- What a great idea! Love how you added it with shrimp! 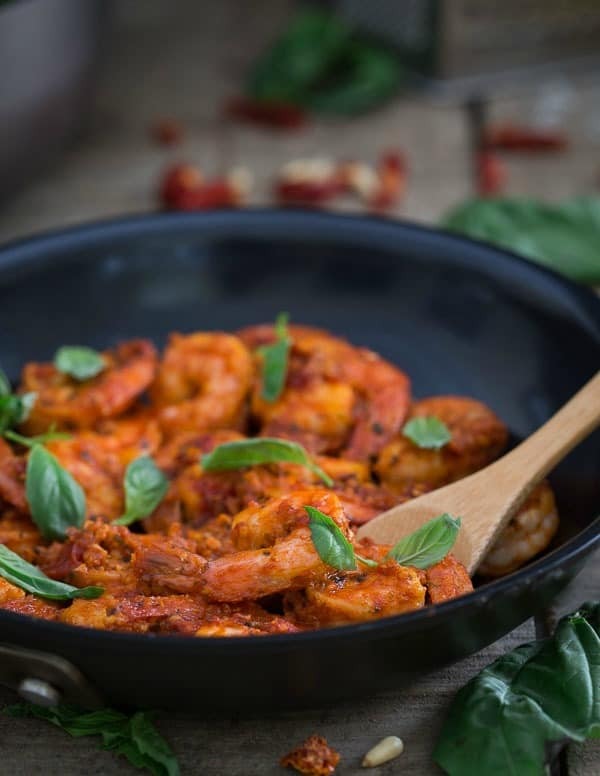 Where’s the recipe for the shrimp romesco you talk about? Did you read the post? The shrimp is from Bumble Bee SuperFresh’s line. It’s a great, easy frozen meal. Yes, I read the post; I didn’t read it to say this was a packaged preparation. Sorry to bother you! No bother, happy to clear things up. what a super delicious flavor combo and this looks just perfect for those times when cooking an elaborate meal isn’t possible. Who says easy meals can’t look elegant. You nailed it! Pesto couscous is genius! Everything looks so delicious and beautiful! I’ve never been a huge fan of couscous but with pesto? My mind is forever changed!! Love this! This looks sooo good! And that shrimp….it’s calling my name! How do you make the shrimp?! Read the post, it’s one of Bumble Bee’s new frozen meals.